Free Shipping Included! 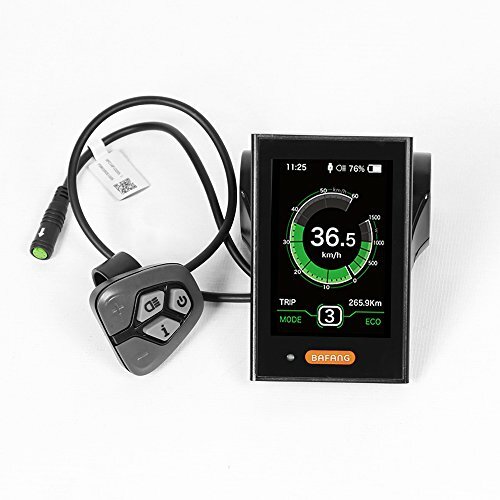 Bafang HMI Colored Display Electric Bike Odometer Bike Speed Meter (C18) by Bafang at Idaho Velo Park. MPN: HMI. Hurry! Limited time offer. Offer valid only while supplies last. The BAFANG HMI with a high-contrast LCD display delivers all important information at a glance and can also be read in direct sunlight without difficulty. The BAFANG handlebar controller gives good feedback, is extremely robust and easy to use. The additional output can be individually controlled by five support levels. The user interface is clearly legible and intuitive to use. The HMI is compatible with the Bus system RS 232. The HMI is protected against contact and ingress of water and dirt and complies with protection class IP 65.